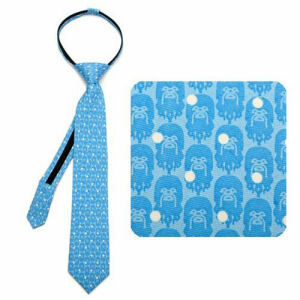 From the Star Wars collection by Cufflinks Inc.. Star Wars Chewbacca Dot Blue Boys Zipper Silk Tie. From the Star Wars collection by Cufflinks Inc.. Star Wars Chewbacca Dot Blue Boys Zipper Silk Tie. The tie measures approximately 14 inches long by 2.4 inches wide. Tie has pre-tied bow with an easy-on - easy-off zipper closure.